"Mueller capitalizes on the recent Chinese interest in foreign history and how China's own global rise aligns with that interest. She captures the essence of this movement by carefully analyzing three recent Chinese documentary television series: Daguo jueqi (The Rise of the Great Powers), Fuxing zhi lu (The Road to Revival), and Ju an si wei (Alert to Danger while Dwelling in Safety) … Mueller's examination of the series is thorough, including detailed textual analysis, coupled with much secondary literature, from both academic and journalistic sources. Particularly instructive is the final chapter, in which the author offers a theoretical discussion of how history is presented on screen, whether in historical films, documentaries, or docudramas. The content and organization are excellent. "The monograph under review is a truly innovative work which is situated at the intersection of Oriental studies, imagology, media research and "memory studies", the latter functioning as a new paradigm in contemporary humanities. The brilliant and multi-faceted work by Professor Gotelind Müller makes us realize, firstly, the necessity of widening the realm of Sinological research as well as of drawing on new scientific paradigms characteristic of contemporary humanities; secondly, that mass consciousness is not as much affected by scientific research itself as by its interpretations by the mass media (in this concrete case by documentary series, which is a highly important issue not only for China); and, thirdly, that countries of Asia and Africa are rethinking their place in world history, which should be carefully watched and analyzed by scholars engaged in Oriental studies." 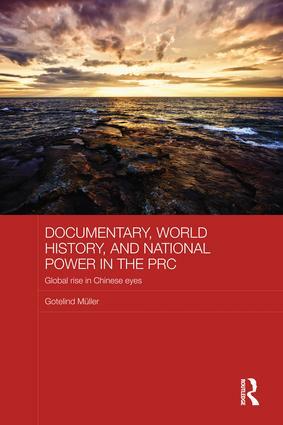 Gotelind Müller is Professor of Chinese Studies at the University of Heidelberg, Germany.